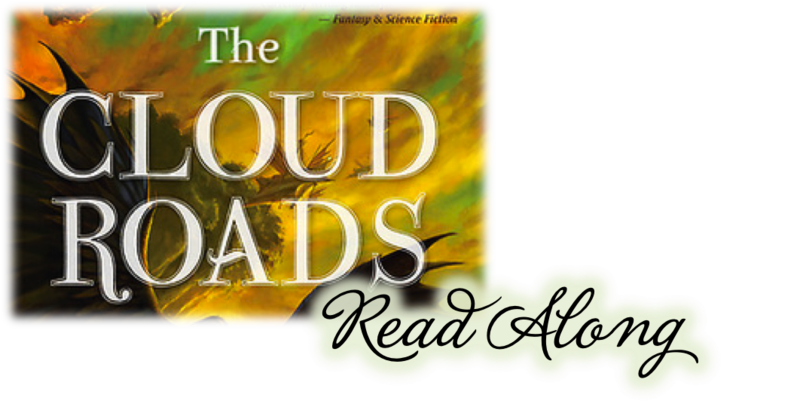 We’re starting a new Read-Along this week, with The Cloud Roads by Martha Wells! If you’re interested in participating, visit the SF/F Read-Along group for more information and to join the discussion. With thanks to Anya for the read-along banner! Moon has spent his life hiding what he is — a shape-shifter able to transform himself into a winged creature of flight. An orphan with only vague memories of his own kind, Moon tries to fit in among the tribes of his river valley, with mixed success. Just as Moon is once again cast out by his adopted tribe, he discovers a shape-shifter like himself… someone who seems to know exactly what he is, who promises that Moon will be welcomed into his community. What this stranger doesn’t tell Moon is that his presence will tip the balance of power… that his extraordinary lineage is crucial to the colony’s survival… and that his people face extinction at the hands of the dreaded Fell! Now Moon must overcome a lifetime of conditioning in order to save and himself… and his newfound kin. 1. What do you think of the world Martha Wells has created? First time readers, do you find it more difficult to get a handle on than fantasy worlds more closely tied to Earth? 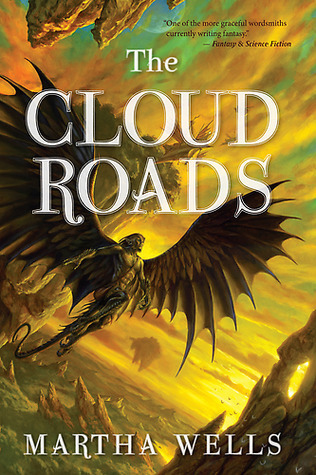 Mogsy: This is my first time reading The Cloud Roads, but it isn’t my first venture into this world. Before this, I’ve read one volume of the short stories as well as The Edge of Worlds, so technically I’ve encountered the Raksura before and met some of these characters. I think I would have been more confused otherwise. The first time I read about Raksuran biology and how their society worked, I remember feeling sooooo overwhelmed! These days it’s still rare to find a novel, even a fantasy title, that stars non-humans. Everything about the Raksura is just so “alien” and I’m sure that has a huge impact on how quickly or easily a reader can get a handle on things. 2. From Moon’s internal narration, it can be clear that his experience with the Cordans has not been uncommon. Do you agree with Moon’s decision to try and make a life among them? What about the Cordans’s ousting of him? Mogsy: I suppose for someone who knows he does not belong anywhere, but still yearns for the comfort and safety of being a part of a community, Moon’s decisions make sense. He’s doing it because there’s no other alternative. And yes, I did get the feeling that deep down, he knows that each time he stays with a settlement of groundlings, it would be a temporary solution. The circumstances around the Cordan’s ousting of him are a bit extreme, but it didn’t seem like Moon was all that surprised it happened. 3. What are your initial impressions of Indigo Cloud? Do you think Moon made the right choice in coming along with Stone? Mogsy: My current impression of Indigo Cloud right now is that they are one hot mess, led by a queen who knows she’s losing her grip on power and the truth of it is freaking her out. As for Moon, considering how Stone got him to come along with him under false pretenses, I’m not sure I could say one way or another whether Moon made the right choice. However, given how little he knew at the time, I guess the temptation to go with Stone would have won out on matter what, since finding others like himself was something Moon always wanted. 4. We’ve had only a glimpse of the Fell, but they’re clearly bad news. What do you think is going on with the Fell’s offer of a treaty? Mogsy: I’m going to guess trickery is afoot! Granted, I don’t have much to back up my prediction, only that I’ve read a later book in the sequence and know that the Fell and the Raksura are still enemies of each other, which makes me think that any peace treaty or such here will come to naught. I’m very curious to see what will happen though! Drat – I saw this readalong and wanted to join but didn’t think I could fit it in – I just have just dived in as I know I’ll regret it! Happy reading, I’ll avoid the post for fear of spoilers. Oh … I have this on my potential backlist burndown list. Not sure it will make it to this month though. Will have to decide sometime soon!